What’s a Lean Business Plan? Lean business planning starts with a lean business plan. The lean plan contains four essentials every business needs, and nothing else. It’s a streamlined core plan for running the business, not a document or detailed plan, full of descriptions, to be presented to investors or lenders. It’s to optimize management. Here’s what the lean business plan includes. Who you are, what you do, and for whom you do it. Ideally, the smaller your business, the more focused. Maybe you keep it in your head, always — and lots of us do that — but maybe you write it down. Simple bullet points. Just reminders. Planning outside of strategy is a waste of time. I like IMO: Identity, who you are; Market, whom you reach; and Offering, your product or service (what you sell). But don’t sweat IMO or any strategic framework too much. Strategy is focus. It’s as much what you’re not doing, whom you’re not reaching, as what you are doing and whom you reach. 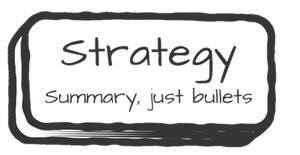 Strategy without tactics is just puffery. Keep your strategy in mind — your focus, what you are and aren’t doing, for whom — as you develop specific action plans filled with tactics that make strategy matter. This is all about execution. Marketing tactics: Target market, differentiators, positioning, messaging, pricing, channels, online presence, engagement, content, sales structure, and all the old-fashioned marketing mix stuff like advertising, public relations, special promotions, and so forth. Offering (product or service) tactics: launch dates, feature sets, packaging, product lines and options, apps, menu items, Stock Keeping Units (SKUs), services, website, technology, vendors, delivery options, and so forth. Financial (and admin and infrastructure) tactics: Funding and financing, hiring and recruiting, training, policy, and so forth. And don’t think of all this as a document. At least, not yet. Early on, it’s a matter of form following function; you keep it in bullet points, maybe orderly sections, but none of these plans are independent of all the others. Do think about strategic alignment. What you do with your tactics should flow from your strategy. And what this means, specifically, is that you think all these factors through, and set down some plans, in writing but not fancy text, just bullets, so you can get back to them at least once a month to see how you’re doing. It might even be a bit like the classic business plan, covering topics like pricing and distribution — except that you do it for yourself. Keep it just big enough to run the business. Review schedule: This is absolutely essential. This is the real world, in which we’re all very busy. If you don’t schedule your monthly review in advance — and then follow up and do it — it’s not likely to happen. I always did it the third Thursday of the month, and you do it whenever — but make sure that “whenever” is a real date. List of assumptions: You should always list assumptions because that’s the first thing you look at when it’s time to revise. You set the plan running, then track results, and when results are different from the plan (and they always are), you look at assumptions first to see whether they have changed. If so, then revise the plan. If they haven’t changed, maybe you still revise the plan, but you look first whether you executed correctly. Milestones: What’s supposed to happen, when, and who is responsible? It’s a simple list to do, but it’s the core of execution. Tailor it to fit your needs, so it’s either reminders for yourself, in its simplest form; or commitments from the team, plus budgets, start dates, end dates. This is for real management accountability. This is so you can track progress and deal with standstills. Metrics: These are performance metrics, the other side of milestones, also for real management accountability. Of course the most important are sales, costs, and expenses, with the details of who is responsible for which lines or revenue or spending. But most businesses have many other useful performance metrics, like web traffic, conversions, foot traffic, sales per square foot, sales per employee, tweets, followers, minutes per call, presentations, leads, lines of code (ugh), contacts made, likes, retweets. Tailor this for your business. You can’t optimize management without managing the money. You need to forecast your basic business numbers because without the forecasts, you can’t track results and catch problems or capitalize on pleasant surprises. Don’t worry too much about forecasting; just do it. If you can run a business, you can do a basic forecast of sales and costs. It’s not about being accurate; it’s about laying out realistic assumptions. Of course you’ll be wrong, but with good assumptions you can track how you were wrong, in what direction, and make regular corrections. And you can’t plan a business without considering cash flow. Although for some simple businesses, cash flow is a matter of staying profitable, keeping sales above costs and expenses; for most businesses, it’s much more complicated because you don’t get paid exactly when you make the sale, and you have to buy things ahead of time. Being profitable doesn’t guarantee having money in the bank. If you’re like me and most businesses, you start with a lean plan and then get going. Track the plan results, do your reviews, and revise often. Your first plan is done. Now execute. You may have heard of the lean startup or lean manufacturing. It’s a set of ideas that started about 70 years ago, revolving around PDCA: plan-do-check-adjust. The idea came up first related to the auto manufacturer Toyota, as lean manufacturing; that goes back 70 years. It was also called “the Toyota way.” It was adopted later by by a collection of experts and authors, most notably Eric Ries and Steve Blank with their work on The Lean Startup. It’s a process of continuing improvement in steps, or cycles, each one involving plan, action, checking results, and revising the plan to start again. That term “lean,” and the idea of continuous process, applies perfectly to business planning. It’s a shame that so many people think of a business plan as a document, the formal business plan; but good planning is a streamlined simple plan in a process that could be called PDCA, which I prefer to call PRRR: plan-run-review-revise. 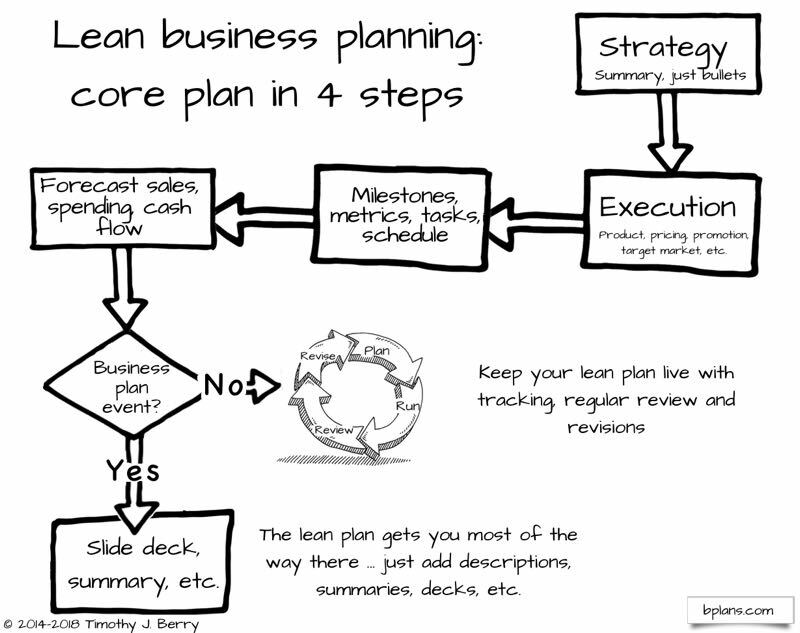 If you’re a business facing a business plan event, then your lean business plan is still most of what you need. Just add an executive summary and, if needed, market information, pitch deck, and whatever else is required. This is important: form follows function. So of course you want a plan, no matter who you are or how big or how new your company is. However, that doesn’t mean everybody needs to have the full formal business plan with all the supporting information. For example, you might be running or growing or starting your own one-person business. You feel very comfortable about knowing your customers and your market, and you have a strategy. Why are you writing all this down, formalizing it, making a big project that you don’t really need? No good reason. Planning is about the decisions it causes, not about showing off your knowledge. You do what the business needs demand — no more, no less.